Eight a.m. Danny comes driving up to the gate. I've been up since six thirty getting ready, eating and "running" the dog. After comes in and talks to Barb for a while I throw my gear in the back of his car and take off up the Valley Road toward the forestry gate. It's just a short trip and after parking Danny puts on his boots as I grab the gear from the rear of his car. I'm wearing street shoes as my hiking boots being steel cleated baseball shoe are rough on the feet on the paved road. Here is a map of today's adventure. We followed the solid black line (paved road), the dotted white line (Wai`anae Kai Loop), the red/white dotted line (the Tiki Ridge trail), The orange dotted line (going down the Wai`anae Kai/Kumaipo Trail to the road. The forestry gate is at elevation 600' and we begin walking around 8:40 a.m. Just as we begin another car pulls up. We continue but soon hear talking as to young guys are catching up to us. Turns out they are firemen from Kapolei out for a little exercise, the soon pass us by. They are planning to only do the paved road. We meet them again on their way down and talk for a while about harvesting coffee. Danny and I arrive at the paved roads end about 40 minutes after starting. There I remove my street shoes and stuff them in my back pack. I then get out the extra socks, gaiters and my hiking (baseball) boots. From the roads end we take off into the bush to our left, down the trail marked w/white bottle caps (9:20 a.m.). This is the beginning of the Wai`anae Kai Loop hike. We plan to add an optional off shoot for advanced hikers to this relatively easy hike. 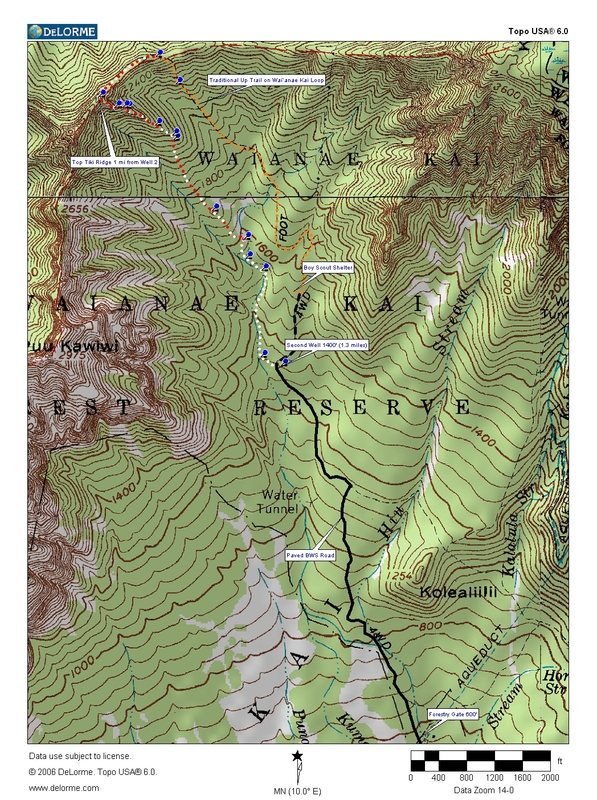 Tiki ridge starts out easy, in fact easier than the traditional ridge used to gain the crest of Kamaileunu Ridge. It is the last 500 running feet that makes Tiki Ridge an experts only hike. In a few minutes we are down at the dry bed of Kumaipo Stream and the Jack Fruit tree. We then head upstream. The stream beds main vegetation are tall Kukui Nut trees and the under story is guava and all spice plus a bunch of other introduced plants. Here is one view of the vegetation and Danny.